Twice as big as Earth, the super-Earth 55 Cancri e was thought to have lava flows on its surface. The planet is so close to its star, the same side of the planet always faces the star, such that the planet has permanent day and night sides. Based on a 2016 study using data from NASA’s Spitzer Space Telescope, scientists speculated that lava would flow freely in lakes on the starlit side and become hardened on the face of perpetual darkness. The lava on the dayside would reflect radiation from the star, contributing to the overall observed temperature of the planet. Now, a deeper analysis of the same Spitzer data finds this planet likely has an atmosphere whose ingredients could be similar to those of Earth’s atmosphere, but thicker. Lava lakes directly exposed to space without an atmosphere would create local hot spots of high temperatures, so they are not the best explanation for the Spitzer observations, scientists said. 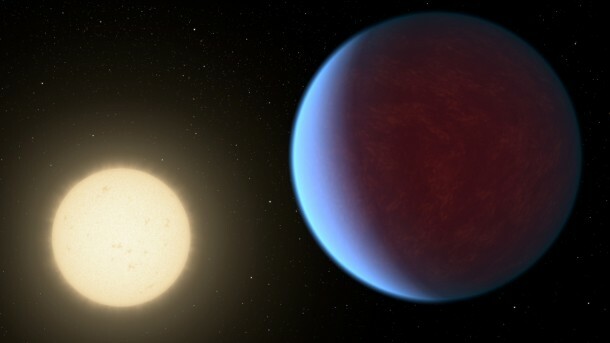 The super-Earth exoplanet 55 Cancri e, depicted with its star in this artist's concept, likely has an atmosphere thicker than Earth's but with ingredients that could be similar to those of Earth's atmosphere. Using an improved model of how energy would flow throughout the planet and radiate back into space, researchers find that the night side of the planet is not as cool as previously thought. The “cold” side is still quite toasty by Earthly standards, with an average of 2,400 to 2,600 degrees Fahrenheit (1,300 to 1,400 Celsius), and the hot side averages 4,200 degrees Fahrenheit (2,300 Celsius). The difference between the hot and cold sides would need to be more extreme if there were no atmosphere. “Scientists have been debating whether this planet has an atmosphere like Earth and Venus, or just a rocky core and no atmosphere, like Mercury. The case for an atmosphere is now stronger than ever,” Hu said. Researchers say the atmosphere of this mysterious planet could contain nitrogen, water and even oxygen — molecules found in our atmosphere, too — but with much higher temperatures throughout. The density of the planet is also similar to Earth, suggesting that it, too, is rocky. The intense heat from the host star would be far too great to support life, however, and could not maintain liquid water. Hu developed a method of studying exoplanet atmospheres and surfaces, and had previously only applied it to sizzling, giant gaseous planets called hot Jupiters. Isabel Angelo, first author of the study and a senior at the University of California, Berkeley, worked on the study as part of her internship at JPL and adapted Hu’s model to 55 Cancri e.
In a seminar, she heard about 55 Cancri e as a potentially carbon-rich planet, so high in temperature and pressure that its interior could contain a large amount of diamond. “It’s an exoplanet whose nature is pretty contested, which I thought was exciting,” Angelo said. Spitzer observed 55 Cancri e between June 15 and July 15, 2013, using a camera specially designed for viewing infrared light, which is invisible to human eyes. Infrared light is an indicator of heat energy. By comparing changes in brightness Spitzer observed to the energy flow models, researchers realized an atmosphere with volatile materials could best explain the temperatures. There are many open questions about 55 Cancri e, especially: Why has the atmosphere not been stripped away from the planet, given the perilous radiation environment of the star? “Understanding this planet will help us address larger questions about the evolution of rocky planets,” Hu said. NASA’s Jet Propulsion Laboratory, Pasadena, California, manages the Spitzer Space Telescope mission for NASA’s Science Mission Directorate, Washington. Science operations are conducted at the Spitzer Science Center at Caltech in Pasadena. Spacecraft operations are based at Lockheed Martin Space Systems Company, Littleton, Colorado. Data are archived at the Infrared Science Archive housed at IPAC at Caltech. Caltech manages JPL for NASA.